MTV Tr3s’s new show, Quiero Mi Baby premiered on Monday April 16th – it’s a new series that shows the realities of cross-cultural parenting including language, religion and tradition clashes, in addition to many other issues unique to bi/multicultural families. Quiero Mi Baby is a show I relate to on many levels and I know a lot of our SpanglishBaby familia will as well. Check out this exclusive preview (meaning YOU WILL ONLY SEE IT HERE!) of tonight’s episode and then see our interview with the couple, Jada and Kristian, below. SB: The preview of your episode was difficult for me to watch. I’m also a “gringa” who fell in love with a Latin American man and although we were never separated by the border as you were with Kristian, it was something my husband and I worried about in our first few years together. What made you decide to leave Kristian behind in Mexico and come have your baby in the United States? Jada: Several factors were discussed, the first is that we wanted our son to have American citizenship and we knew that if he was born in another country the process would be very lengthy. We figured worst case scenario I would be alone for the first 6 months of the pregnancy, while Kristian’s paperwork came through. We never expected it to be one year before we would bring him to the States. Second, I wanted a natural childbirth and I was told that communication was key in this process. I wanted to make sure I had a strong English speaking medical team so I can understand everything that was happening. 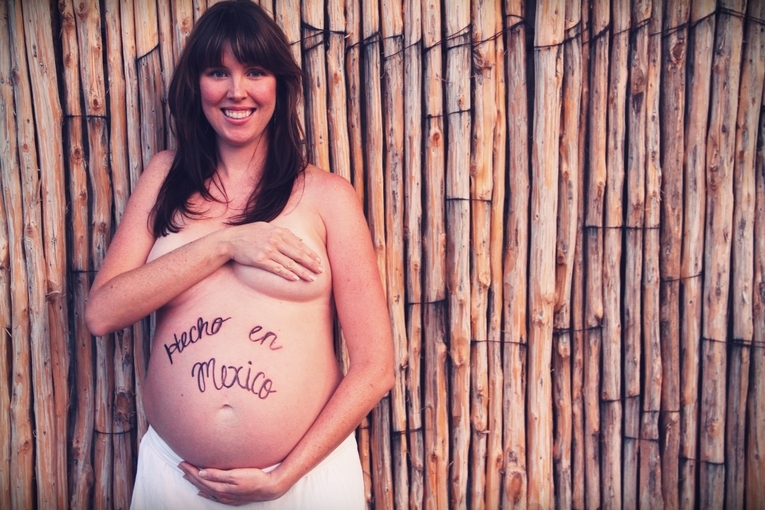 I didn’t want to find myself needing to have translated what’s happening mid-birth, that made me nervous. I needed to be sure the environment would be calm and smooth, so this was the best solution for us. SB: The description of the episode says that you moved to Mexico for your love of Latin culture and to learn Spanish – Where did that passion for Latin culture come from? How far are you in your Spanish studies and how, as a non-native speaker, do you plan to raise your new baby boy to be bilingual? Jada: I turned 30 in September and at 4 years old I have a very vivid memory of encountering a Mexican family, and listening to someone my age speak to her mom – and I thought ‘wow she’s saying the same thing but in a different way.’ From that moment on I was very intrigued by the culture and being Italian, there are many similarities. My family also fostered a lot of relationships with friends who were Mexican and Cuban growing up, so I was surrounded by the culture quite often. I feel confident about speaking the language and understand it well… sometimes my grammar and tenses are off which is embarrassing but my in-laws are very proud and supportive. And yes, I definitely want our son to be bilingual. We only speak Spanish at home and we take him to Spanish story time at the library. SB: As I told Jada, the preview for your Quiero Mi Baby episode was difficult for me to watch – Many other people have been in your position including friends of mine who are living far away from their husbands and/or father of their children due to lack of a visa – it’s heartbreaking. I wonder, do you worry much that your son is growing up outside of your culture and language? Kristian: He’s growing up different than I because of the environment and where we live but we reinforce my culture and language in the home as much as possible. I take him to Latin dance classes, festivals, my in-laws teach me Mexican recipes when we see each other. I talk to my family in Mexico about 2-3 times a week. And we plan to travel as much as possible when the baby is older, so he can grow up around cousins and family. Given that we’re both teachers, I’ve also thought about moving the family to Mexico for the summers. SB: I noticed in the video that you speak Spanish to Jada and the baby – is it important to you that your son is bilingual? Why? Kristian: I’m an artist by trade and when it comes to storytelling, poetry in Spanish, it’s so engaging and I want my son to love it, and to understand, and it’s just not the same translated – the emotion is not the same. I want to teach my son and share experiences with him in my native language. It’s where I feel most comfortable and confident that I’m getting my message across. Do you relate to Kristian & Jada’s story? Want to see what happens? I LOVE Quiero Mi Boda and can´t wait to watch this show! I will have to check if its playing in Colombia. I fell in love with this story…its very similar to mine.i was wondering if there was a twitter or something i can reach them at?? This is by far the most beautiful love story. Hey would you mind sharing which blog plawtform you’re working with? difdficult time deciding between BlogEngine/Wordpress/B2evolution andd Drupal. something unique. P.S My apologies for being off-topic but I hadd to ask!